This blog post will address all of these questions and hopefully put you in a much stronger position to launch your proximity marketing campaigns. Proximity marketing is about communicating with your shoppers and visitors at the right place, that is when they are in the sight of a given product or store. There are a couple of proximity solutions that marketers and business owners have been using that do not involve technology – physical signage and banners across the store and various locations. But now that technologies are becoming much more affordable, businesses are willing to integrate them into their marketing strategies. Advanced methods such as QR codes, NFC tags, Bluetooth beacons and others address the same problem but with different capabilities and ROI. Let’s take a look at each of their capabilities and costs. There isn’t really a single correct proximity solution. NFC is more suited to customers who are willing to engage and get up close. WiFi solutions typically require customers to log in to WiFi and access captive portals. Bluetooth beacons, on the other hand, are versatile due to the wide adoption of Bluetooth among users and have far fewer requirements beyond a smartphone with mobile data access. Also, beacons are extremely affordable and generally lead to an excellent ROI. Cards that sound like a sales pitch and push messages might have returns, but being smarter and more creative with cards will definitely have better returns. Common placement areas include entrances, the full store (for small, single brand stores), specific departments, fitting rooms and checkout areas. It is recommended to avoid getting too specific too quickly, but with beacon campaign data you can experiment new placement strategies. House of Blue Jeans placed beacons on their trial room mirrors. These beacons did not push offers but the chance to take and share photos in different dresses. Not surprisingly, they found customer’s try 90% more product items on the Interactive Mirror than inside the traditional fitting room. Beacon Analytics: What to measure and what is good enough? To better understand what parameters to measure, let’s consider the retail industry as an example. Show various offers to the customers as they move around the store and create engagement with those offers. The store runs the campaign for 2 weeks before they can measure performance. 2 weeks is a recommended time duration for data collection considering usual variations in footfalls across weekdays and weekends. The example in consideration will obviously have busy weekends and slower Wednesdays. The number of times a Bluetooth beacon signal is detected by a smartphone in the proximity, is counted as a notification. This is a measure of your campaign reach. Let’s take the Yellow stores for example. What is a good number of notifications sent? The number of notifications sent entirely depends on footfalls. A study on Beekn.com suggests that on average 33% of users have their Bluetooth on while they are roaming around. This number also varies from country to country. For example, US and Canada have rates as high as 50%, while Russia has 25%, and in the UK it is 33%. So based on the country, you can calculate the ideal number of notifications that should be sent. Click through rate suggests how many users opened the notifications you sent. 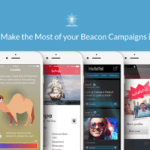 It is the most important parameter for your beacon marketing campaigns. This also lets you analyse which areas are having better conversions. Based on this, you can increase the number of notifications in a particular area or if the performance is really poor you might consider relocating the beacon elsewhere. What is a good number for CTRs? Companies like Coca-Cola have witnessed CTRs are high as 60% for their beacon campaigns, which means, more than half the people who received the notifications opened them. That’s undoubtedly amazing, but not typical. unfortunately, that’s not a frequent thing Most SMBs see a CTR of 1-4% for their beacon campaigns, which is approximately 15 times the average CTR for a banner and online ad. Beacons are a new tool in the digital marketer’s arsenal that can have game-changing implications. This is especially true for those who want to target or craft an experience based on location within a physical environment, such as a retail store location, stadium, hotel, airport, or concert venue. The type of analyses and optimizations discussed within this post will help digital marketers and analysts fully leverage beacons to move the needle forward for their business. Are Brands ready for Mainstream Beacon Deployment? could you please share how beaconstac track those stats(technically)?